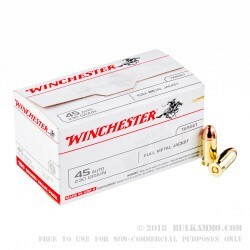 Whether you're looking for ammo to take to an upcoming training course or heading out to the range with friends, Winchester's 45 auto ammo is a great option for reliable range ammo. 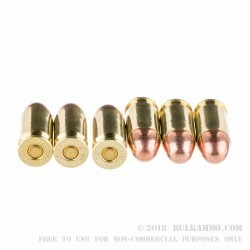 This ammo features 230 grain full metal jacket projectiles loaded into reloadable, boxer-primed brass cases. 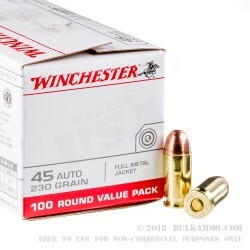 Winchester is an iconic American brand that is a staunch supporter of the 2nd Amendment and has over 150 years of experience in the firearms and ammunition business. Most of Winchester's handgun ammo is now loaded in their new Oxford, MS location where all ammo undergoes various quality checks, visual inspections, and frequent function testing at their range where they have hundreds if not thousands of firearms to test with to ensure that their ammo can function in a very wide array of models. This helps ensure that when you get out on the field that you can count on consistent function and reliability. 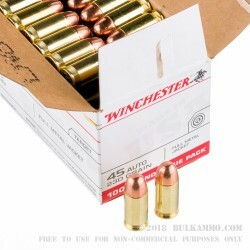 Great ammo for the range! Run through 400 of my 500 rounds without fail. Pretty clean. Very satisfied with Winchester in my RIA Match Target .45. Only complaint is that 3 of my 5 boxes literally fell apart, so I had to dump the rounds into an ammo can. Not sure what could be done to prevent that. Made it through a week long Gunsite class with this stuff. Q: What's the ballistic difference between 'Service Grade' and the ammunition equivalent in the white box? I only run mil-spec .45 acp through anything. A: The Service Grade is loaded to NATO standards and is slightly hotter than standard SAAMI standards - 865 FPS vs the 835 FPS from the white box.